The air outside the container absorbs the pharmaceutical grade oils. 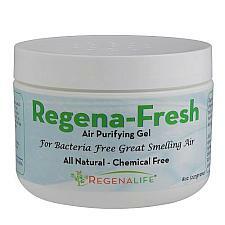 As the air circulates and lands on the source of the odor (mold, mildew, etc), Regena-Fresh begins neutralizing odors on contact naturally with no chemicals and continues to fight odors until the Gel has fully evaporated and is no longer in the container. Regena-Fresh Uses: Eliminates unpleasant odors inside Cars, RV’s, Boats, Houses, Basements & Crawl Spaces. Also great for Cigarette & Pet Odors, Mold & Mildew.